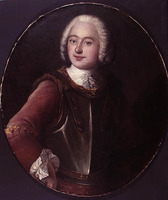 FORANT, ISAAC-LOUIS DE, naval officer, knight of the order of Saint-Louis, third governor of Île Royale (Cape Breton Island); b. probably in the mid-1680s, at La Tremblade (department of Charente-Maritime), 25 miles southwest of Rochefort; d. unmarried on 10 May 1740, at Louisbourg. He was the grandson of Job de Forant (1612–92) who, following his conversion from Calvinism, rose to the rank of rear-admiral in the French navy in 1686. Isaac-Louis de Forant entered the naval service as a midshipman at Rochefort on 19 Nov. 1703. On 1 Nov. 1705 he became sublieutenant in the navy, and on 12 Nov. 1712, lieutenant-commander. He was for several years the commander of the king’s vessel Héros, which he sailed frequently to Louisbourg and Quebec in the 1720s and 1730s. On 1 April 1739, Forant, a naval captain since October 1731, was named governor of Île Royale; François Bigot* was appointed financial commissary at the same time. Though Forant voiced his displeasure at so menial an appointment, when his colleagues were serving in the colonies as governors general, Maurepas, the minister of Marine, persuaded him to accept the appointment with good grace. The authorities, in appointing Forant and Bigot to Île Royale, obviously counted on them to solve the serious problems and to end the disorders of scandalous proportions which were retarding the progress of the entire colony. In his instructions of 26 May 1739, Maurepas singled out the lax discipline of both the officers and troops. He urged that stringent measures be taken to curb absenteeism and excessive drinking. He also urged action be taken to end irregularities respecting guard duties, the distribution of food rations and merchandise from the stores, and the payment of wages and supplementary earnings to the troops, all of which served to perpetuate the problems of indiscipline and low morale. After consultations with his predecessor, Joseph de Monbeton* de Brouillan, dit Saint-Ovide, Forant, with a domestic staff of four men and two women, sailed with Bigot from Île d’Aix aboard the Jason on 30 July 1739. He disembarked at Louisbourg on 10 September. His first official action was to inspect the assembled troops; in his first dispatch to the minister he candidly stated that they were the worst he had ever seen. Following the inspection, Forant gathered all the captains in his quarters at the Château Saint-Louis and read to them pertinent passages from the minister’s observations of the previous May. In Forant’s words, the officers “seemed extremely moved by the unfavourable opinions communicated to you about their behaviour,” and seemed determined to show the minister that they were not so wholly to blame as his informants would have had him believe. During the following two weeks, Forant rid the garrison of its most glaringly unsatisfactory elements. By discharging only the incapacitated and the obviously inept, retaining temporarily those who did not conform to official stipulations as to size, and with the recruits of 1739, he was able to keep the companies at 56 men each. Though he begged for 100 more recruits “[so that he could] continue the reforms and make the troops acceptable,” only 60 men were sent in 1740. He obtained sheets and mattresses for the barracks, which were so infested with vermin that on summer nights soldiers preferred to take their blankets to the top of the ramparts and sleep in the open air. Forant also founded an artillery school to serve the needs of Louisbourg, which depended on the efficiency of its artillery. In the meantime, however, Forant became seriously ill in late April, and on 10 May 1740 he died of an inflammation of the lungs. Bigot, who wrote glowingly of his superior’s qualities, had Forant interred beneath the Château Saint-Louis chapel. His remains, though not positively distinguished from those of a fellow officer, were discovered by archaeologists in 1964. When he made his will Forant was obviously in the final agony, judging from his six laboured attempts to affix an adequate signature. After bequeathing to his colleague Bigot his eleven-volume set of Moreri’s Grand dictionnaire historique and to the governor’s residence his tapestries and paintings, which were numerous and of fine quality, he asked that something be given to his domestics and those who had assisted him in his illness. In a gesture which was unparalleled in Louisbourg’s short history, he stipulated that the residue of his estate be used to provide eight bursaries for the education at the Louisbourg convent of the Congrégation de Notre-Dame of daughters of Île Royale officers. After some disagreement on the part of Forant’s sister and only heir, Marguerite de Forant, to whom Bigot had sent her brother’s furnishings, a compromise was reached in October 1741, whereby the sisters would dispose of 32,000 livres from the estate, while the residue was awarded to Mademoiselle de Forant. The following year, in June 1742, the fund was invested in France at 5 per cent per annum. Since Forant served as governor of Île Royale for only eight months, it is pure speculation to draw conclusions about what permanent value his reforms would have had, if he had lived. Conversely, notwithstanding both his failure to act vigorously on the problem of liquor at Louisbourg and the mutiny and siege which his immediate successors had to deal with, Forant’s achievements were sufficiently positive that his brief administration should not be written off as of no lasting importance. Archives Maritimes, Port de Rochefort, E, 364, 366, 368. AN, Col., B, 68, 69, 72; C11B, 21, 22; D2C, 222; Marine, C1, 161; 4JJ, 7, 8; Section Outre-Mer, G2, 185; G3 2046. Louisbourg in 1745; the anonymous Lettre d’un habitant de Louisbourg (Cape Breton) containing a narrative by an eye-witness of the siege in 1745; ed. George Wrong (Toronto, 1897). Le Jeune, Dictionnaire. Guy Frégault, Bigot (2v., Montréal, 1948), I. Lauvrière, La tragédie d’un peuple. McLennan, Louisbourg. In collaboration, “FORANT, ISAAC-LOUIS DE,” in Dictionary of Canadian Biography, vol. 2, University of Toronto/Université Laval, 2003–, accessed April 20, 2019, http://www.biographi.ca/en/bio/forant_isaac_louis_de_2E.html.